Frost Manor resident Grant Thurston helps magician Ron Guttman with a trick during a March 18 performance at the home. 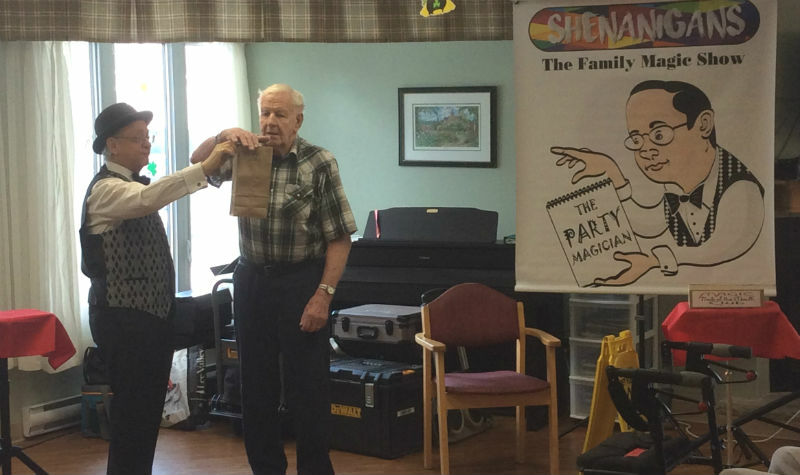 Frost Manor residents wanted to experience a different type of entertainment and magician Ron Guttman fit the bill when he brought his act to the Lindsay long-term care home March 18. At the beginning of the year, residents’ council members had seen a pamphlet advertising Ron’s performance and thought a magician would add a different twist to the usual entertainment residents enjoy. The council also decided that since residents did a good job raising money for the entertainment fund at the Frost Manor Christmas bazaar this would be a good way to spend some of the money, life enrichment co-ordinator Lyndsay Burton. A favourite trick Ron performed involved him drawing a card from a deck and matching the same card staff member Amy Whitehead was holding in her hand, Lyndsay says. You can learn more about Ron Guttman and his performances by visiting his website.